In a previous post, I explained my reasoning behind purchasing a Gazelle Pro laptop from System76. Having never bought direct from a US company before, I had reservations – whether the machine would survive the trip in one piece and how tax would work on the import. System76 mailed me when I made my order, then to confirm that my payment and address were validated and that my machine was being assembled and tested, and finally to confirm that it was on its way, with UPS tracking information. I ordered on the 30th March, and it shipped on 5th April. Not too shabby, given that the Easter holidays were in there, and within the 6-10 business days promised. So far so good. 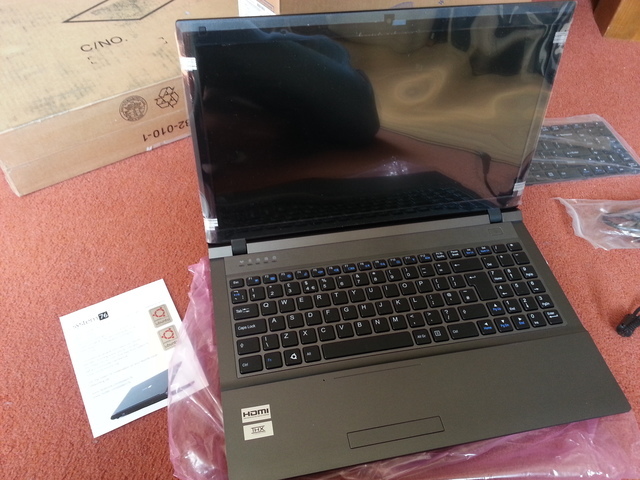 It arrived at my door on the 10th April, exactly when the UPS tracking site said it would. The courier asked for payment of taxes on the doorstep and required payment by cash or cheque. You remember cheques, right? My grandfather swore by them. Fortunately, I could lay my hands on my chequebook (after blowing the dust off it) because who keeps £150-ish in cash laying about? If I hadn’t been able to pay by one of these methods, the package would have gone back with the courier to redeliver the following day, which would have been a pain in the backside. A bit of potential annoyance there, it’s a shame UPS don’t tell you on their otherwise very handy tracking site how much you’re going to need to pay and that you’re need cash to cheques ready to take your package. So – check exactly how you’re going to need to pay taxes. UK folks, right now, keep your cheque book handy or make sure you’ve got the cash to cover it. Anyway. Now, I’ve got a package in my grubby little mits. 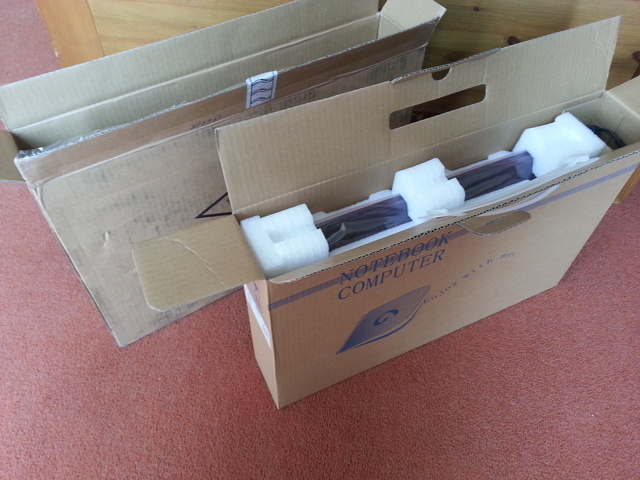 The outer packaging contains another cardboard box. Taking a knife to the tape reveals that inside, the laptop is cradled in a couple of foam holders, with the power brick stashed down the side. A photo follows – nothing fancy, but who cares about fancy packaging anyway? So long as the kit is in one piece. 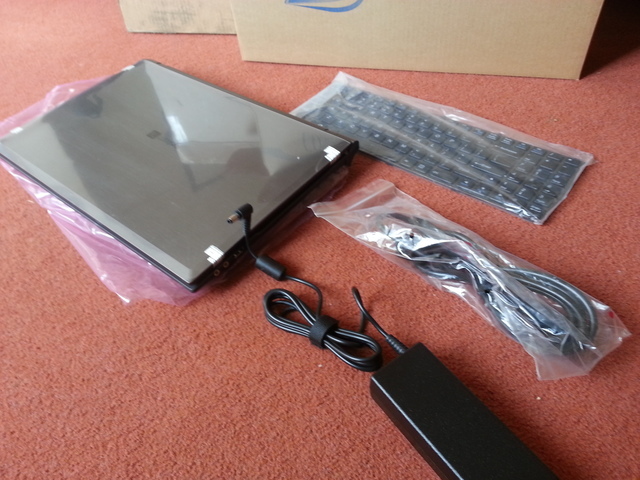 We unpack, to find a laptop with protective plastic covers, a power brick and cable and a US keyboard component. I had the UK keyboard fitted, explaining the spare part. Ah – the power supply cable is for a US power outlet. Not much use for me here in the UK. Could have been a bit of a problem, but fortunately these days most laptop power bricks have a standard three-pin adapter cable between the wall socket and the brick. I swapped my old brick’s UK adapter cable and we’re in business, but it’s something you might need to bear in mind. Something that’s clear from the System76 brochureware and again on removing the unit from its packaging is that it’s no Macbook Air-style ultrabook. It’s not particularly light or thin, but then it’s also not as expensive as those kinds of machine. To my eye, much more a workhorse than a fashion accessory, but I like that. 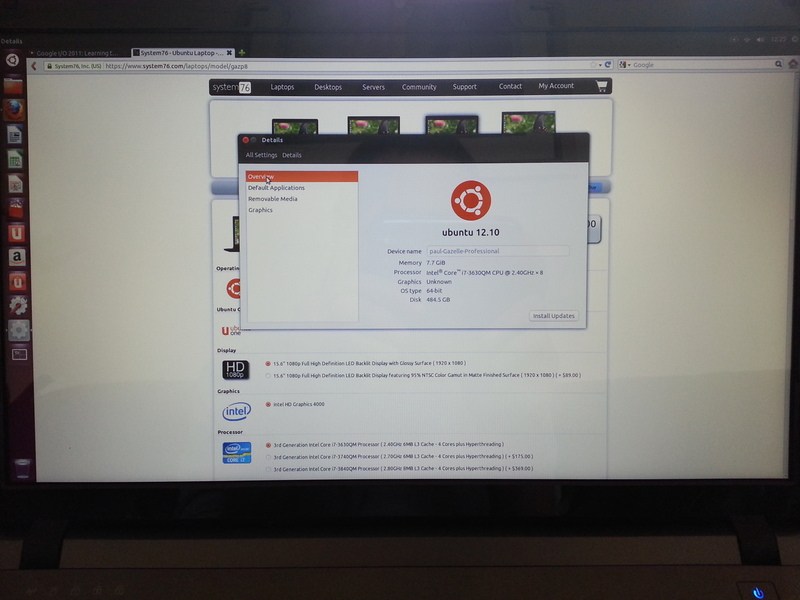 Booting up confirms that the machine works perfectly and that I have the hardware spec I asked for. I cut a corner to keep the cost down a little and went for the standard glossy screen. Was that a mistake? You be the judge. 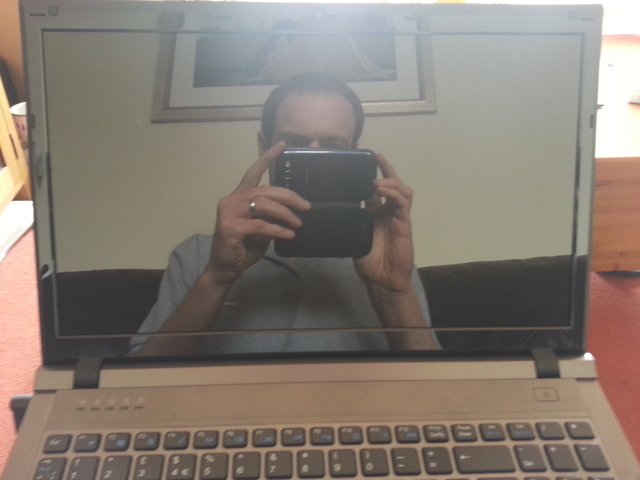 Here’s the screen with the power off, indoors but with bright sunlight streaming through the window nearby. 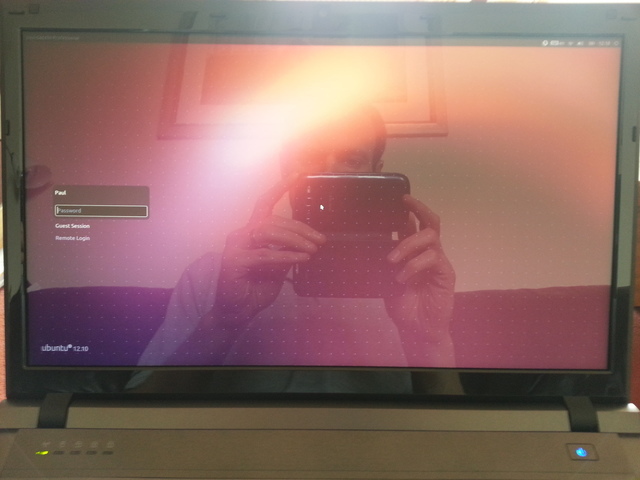 Here is it at the Ubuntu login screen, again in bright sunlight. I’m not sure how the matte panel would fare, but this unit, as is typical of glossy panels, isn’t going to work well in bright light. Still, I bought the unit knowing that this would be the case, so I’d generally be using it in much more subdued lighting conditions. Things are much better after drawing the curtains. So after unboxing, I’m pretty happy. There were only a couple of minor, easily resolvable problems to do with shipping over from the US, and I have the machine I paid for. Next time, the verdict after I’ve installed a different Linux distribution (just can’t get on with the Gnome 3 Unity interface, sorry!) and used the system in anger to do some work.